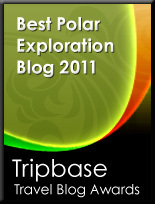 In the Polar category of our Travel Awards, the Tripbase researchers have been to the ends of the Earth to bring you this list of quality blogs. We felt that polar travel deserved its own category because it represents advancements in technology and allows bloggers to convey their own incredible experiences. Two of the most inhospitable places on the planet are at its very top and very bottom. The poles - the Arctic and the Antarctic - are freezing cold and largely impenetrable to conventional vehicles. Indeed, intrepid walkers to the North or South Poles are so far away from civilization that no aircraft could possibly rescue them if they ran into difficulties, even if an aircraft could function in minus fifty degrees Celsius. Pytheas probably found the North Pole in around 325BC on his hunt for tin. It was clearly a dangerous time for shipping then as it is now - the contemporary of Aristotle described the sea as ‘curdled'. Generally, the tourist trail to Antarctica is better trodden. Icebreaker tours are available and visits to the British Antarctic Expedition are available to civilians. The North Pole, while closer, remains more difficult to reach. Jeremy Clarkson and James May famously drove a Toyota to the North Pole having left from Resolute, Canada. This kind of expedition required the full force of the BBC's budget and generally isn't available to the public, but tourists can easily stray into the North Polar Region in Canada, Russia and Scandinavia. So without further ado, the following blogs win awards for offering adventures which were unthinkable a century ago.